Data Studio solves this problem by allowing you to easily connect your data and create beautiful, informative reports that are easy to read, easy to share, and fully customizable. Create up to five custom reports with unlimited editing and sharing. All for free. Put all your data to work. Easily access the data sources you need to understand your business and make better decisions. Transform your data. Quickly transform raw data into easy-to-follow reports and dashboards — no code or queries required. Build engaging reports and dashboards. 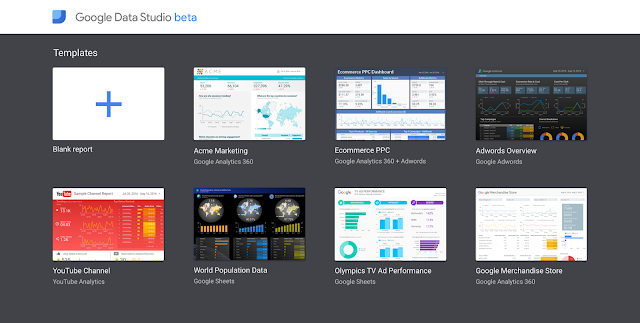 Data Studio gives you the ability to create meaningful, shareable charts and graphs that bring your data to life. Leverage teamwork that works. Work together quickly, from anywhere, by sharing reports via Google Drive. Not sure where to start? Good news: We’re releasing our first batch of templates today to remove that hurdle. Businesses can use a library of templates to get up and running in a matter of minutes. We launched Google Data Studio (beta) in the U.S. earlier this year, and last week, we expanded availability to 21 additional countries. * We’re excited to offer Data Studio to companies across the globe so they can easily create and share reports and dashboards, and ultimately use insights and collaboration to make better business decisions. Organizations today collect an increasingly large amount of data. In a world of web analytics, CRM systems, and third-party sources, data-driven decisions should be easier than ever before. However, all of this data has presented a significant challenge: making it easily accessible and useful. Having multiple data sources that live in silos within your organization compromises your ability to spot critical business opportunities and issues when they matter most. This is a widespread challenge, with 84% of marketers saying they don’t believe their data sources are well-integrated, according to a 2016 Forrester study.